Is it true that people gain weight on birth control pills – and if yes how can you lose it? Posted 11 January 2012 under Ask Us. The truth is most people who take birth control pills do NOT gain weight. Scientific studies have not shown any link between the Pill and weight gain, but medication can affect everybody differently, so it’s a good idea to tell your health care provider if you think you’re gaining weight. Some girls do feel hungrier on the Pill, while other girls may feel more bloated. 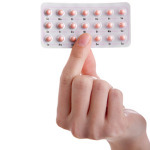 There are many different kinds of birth control pills, so if you happen to have side effects with one type, you may be able to try another kind.